The game begins Game Phase 1, in Anarchy Mode. Immediately after any Player uses a Daykill command, the player they targeted is officially Dead, and cannot post in the thread. Do not post at all if you are dead! You are not even allowed a goodbye post. Wait until the game is over before you say anything. During an Anarchy Mode phase, players may use the command Mode: Democracy. Votes for Democracy are removed using the command Mode: Anarchy. (The color of these votes is unimportant, just make sure I can see them.) Two-thirds of the remaining players in the game must vote for Democracy for the game's mode to switch to Democracy. When the amount of votes necessary to switch modes has been reached, the game is automatically in Democracy Mode, and the Daykill command no longer functions. I will confirm that it is Democracy Mode the next time I post in the thread after the switch. In Democracy Mode, the game phase proceeds as normal Werewolf. Vote for players using the command Vote: Playername. (Use this exact formatting, just like Daykills. Unvote the same way.) When more than half of the game's remaining players vote for a player, they are Dead, and cannot post in the thread. Again, do not post at all if you are dead! Players may use the command Mode: Anarchy to vote for a switch to Anarchy Mode. One over half of the remaining players in the game must do this for the game's mode to switch back to Anarchy Mode. I must post to confirm that it is Anarchy Mode, and any Daykill commands put in before I do so will not be acknowledged. If Anarchy Mode has already taken place this Phase, there is no cooldown on shots for any player, except those who have MOD-assigned cooldown (see the next paragraph). When a player is Dead in any game mode, there is a ten-minute window when posting is still allowed by players other than the Dead player. This window is to allow for accidental posting -- don't abuse it! After the ten minutes have elapsed, posts are not allowed by any player. Players who post after the ten-minute window gain two permanent MOD votes in all future Democracy Mode phases, and 48 hours of MOD-assigned cooldown in all future Anarchy Mode phases. When I have posted in the thread to state the dead player's role, the new phase immediately begins, in the same game mode as the previous phase, and all players may post again. There are no Night Phases in this game. The game ends immediately when the Town or the Werewolves have achieved their win condition. The game does not end if the Jester achieves their win condition. Role PMs are sent out. 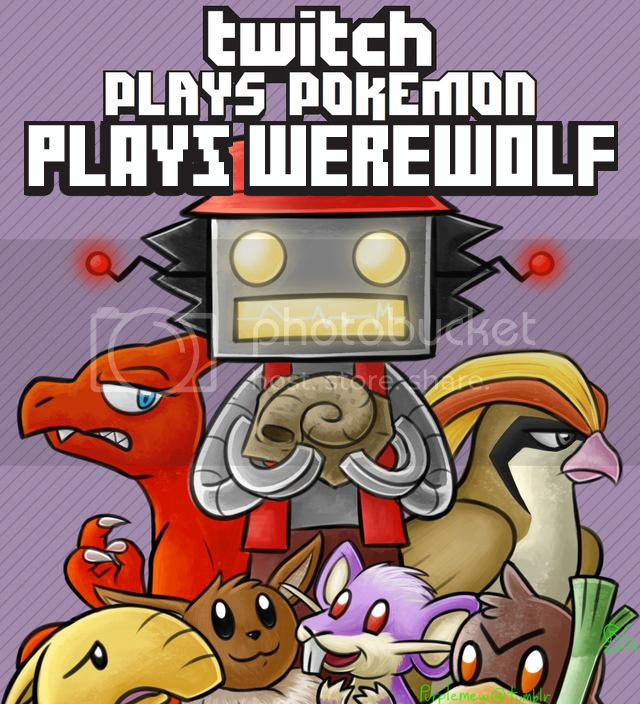 They will contain the name of your game role (Town/Traitor/Werewolf/Jester), and will also contain flavour based on TwitchPlaysPokemon, purely for fun. I have randomized which flavour goes with which role, and which role goes to which player. The flavour of any role is irrelevant to what role they are. Confirm receipt of your role PM in-thread. The game will start when I know that all players have seen their role PMs. Read the rules, because this is not a normal game of Werewolf. I have seen the PM, yes. Yes, we have received and understood our role. Daykill: T1g is something I am ready to type out. 1) If ElwayGuy posts, the game automatically begins exactly two hours after his post, to the second. 2) If Elway doesn't post within a whatever-I-feel-like period of time, I'll contact Knuckle. I think it's relevant to point out, this would not be close enough to proper formatting to count. Exact formatting ensures me of intent to Daykill. The policy also makes certain that claiming intent to Daykill after the post itself won't fly.